As feuding noble houses vying for control, players in Daemon Trilogy: Subrosawill recruit Crews of mercenaries to complete Contracts that range from noble deeds to sinister sabotage. Collect and complete the most lucrative Contracts to seize control of the Empire. 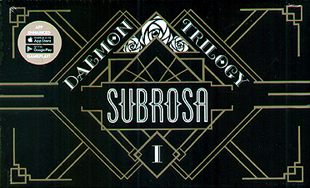 A game of secret information, Subrosa is playable out of the box, or can be supported with the Daemon Trilogy App that guides gameplay by scanning cards and revealing Character actions, leaving players completely blind to those who are behind their misfortune. Begin the Daemon Trilogy with Subrosa, then continue your story as the events that will unravel will affect the rest of the series! Enhance Your Game with the Daemon Trilogy App!